There are still quite a few folks around Tampa trying to figure out what a food truck is and why they are becoming so popular in our cities. 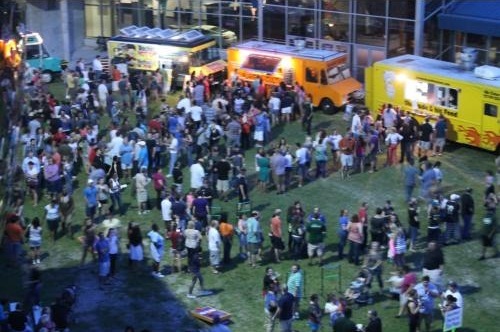 Many benefits with Tampa Food Trucks are readily evident, but there are some that are not so obvious. Exotic food at low prices. Bringing food along to events and venues that don't have food readily available. Entrepenurs creating new companies and jobs. No setup and no cleanup, often times we leave an event or catering site cleaner than when we arrived. Eating from a food truck is just as safe if not safer than eating at a restaurant. Trucks typically get inspected more often than restaurants and are regulated by the same agencies. Did we mention awesome food? Great food from Tampa Food Trucks brings different styles of food you'd normally have to drive for miles and miles to get to all within walking distance. Getting great food, not catered from some goliath chain that brings in cold cuts on a round tray. Catered food that is fresh off the press or grill and into your hands. Tampa Food Truck Catering can really liven up a corporate party, meeting or employee appreciation event. Feeding large groups quickly can easily be accomplished whether at a concert or a local watering hole, food trucks that are well staffed and on their game can feed hundreds in no time. Still skeptical? Give us a try at one of our upcoming Tampa Food Truck Events or reach out to contact us if you think you might have a good place for a truck or twelve to setup.